Soon the blaze raced southward up the arroyo. That’s when the wind carried embers across the bike trail and dropped them into the dry, vulnerable grasslands in the Garden. 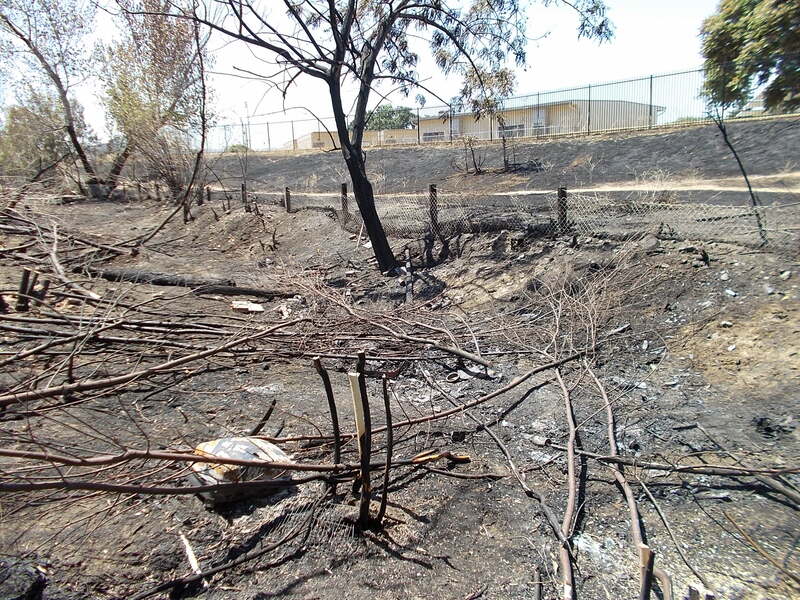 The most serious damage was sustained by the redbud and elderberry where the fire first struck at the north end, and in the chaparral alongside Murrieta Blvd. 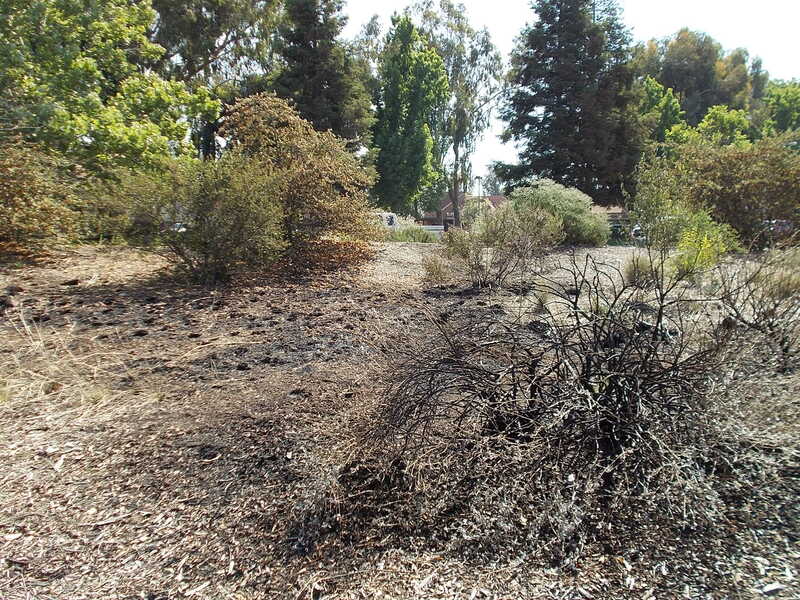 Interestingly, the center of the Garden was not damaged as much as the chaparral area, the section farthest from the arroyo. Fire and Nature It’s been pointed out that fire is part of the natural world. While that is certainly true, as M. Kat Anderson states in her book, Tending the Wild, “Legends about destructive fires reflect the almost universal belief among California Indian tribes that catastrophic fires were not a regular, natural occurrence, but rather a rare punishment for a serious violation of religious and social rules.” In order to avoid uncontrolled fires, the Native Americans took steps to manage their environment — not only to lessen the chance of such fires, but also to decrease brush, recycle nutrients, control insects and pathogens, increase forage for game animals, and reduce competition from weeds to favor plants needed for their food and daily activities. They often did this by means of controlled burns. The indigenous peoples considered these activities to be vital elements of their religious and social responsibilities. 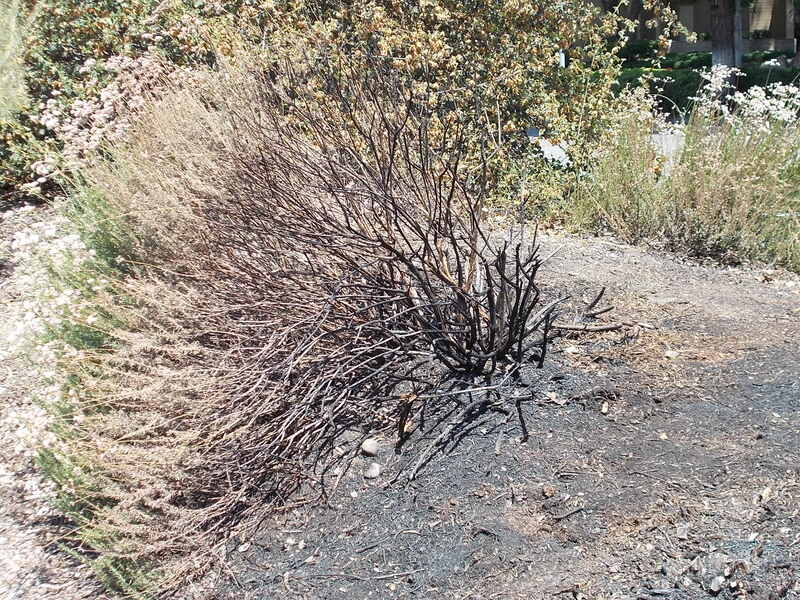 Anderson also quotes a Miwok elder about the relationship of brush to the availability of water in drought-prone California: “They burned to keep down the brush. In those days the creeks ran all year round. You could fish all season. Now you can’t because there’s no water. Timber and brush now take all the water. There never were the willows in the creeks like there are now. Water used to come right out of the ground. 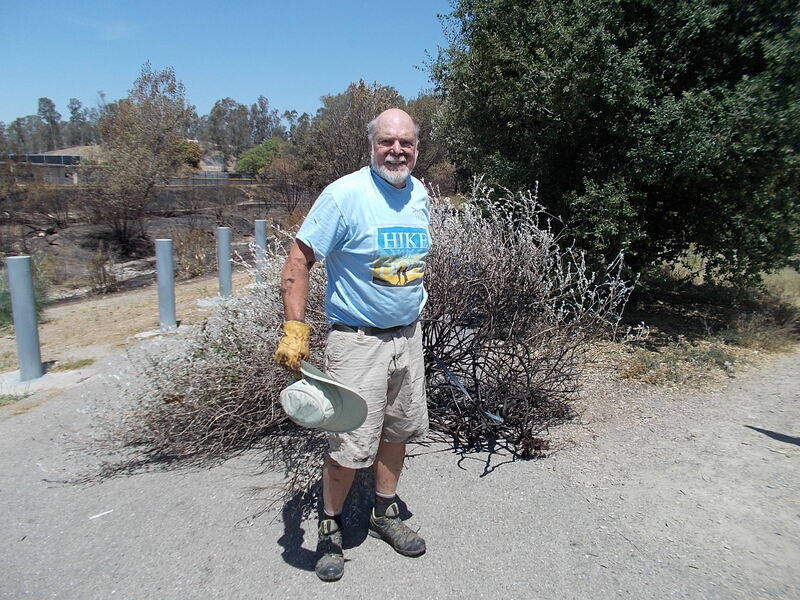 There were big oaks and big pines, and no brush.“ Recent discussion among some of the Garden staff has concerned the amount of brush that accumulates along the arroyo, not just in the vicinity of the Garden but along the entire length of the Arroyo Mocho. 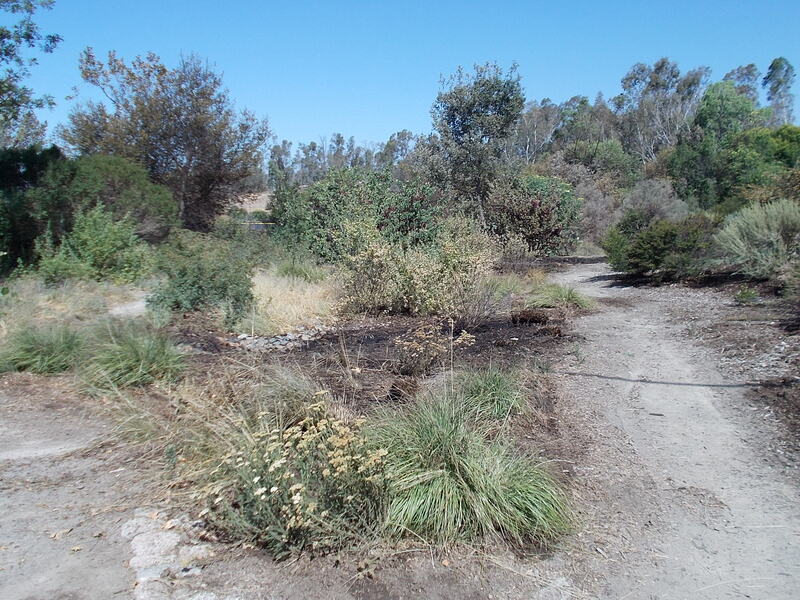 The presence of this brush encourages and hides homeless encampments, and it is well known that such encampments are becoming endemic in the TriValley area. Also, it is obviously a serious fire concern! 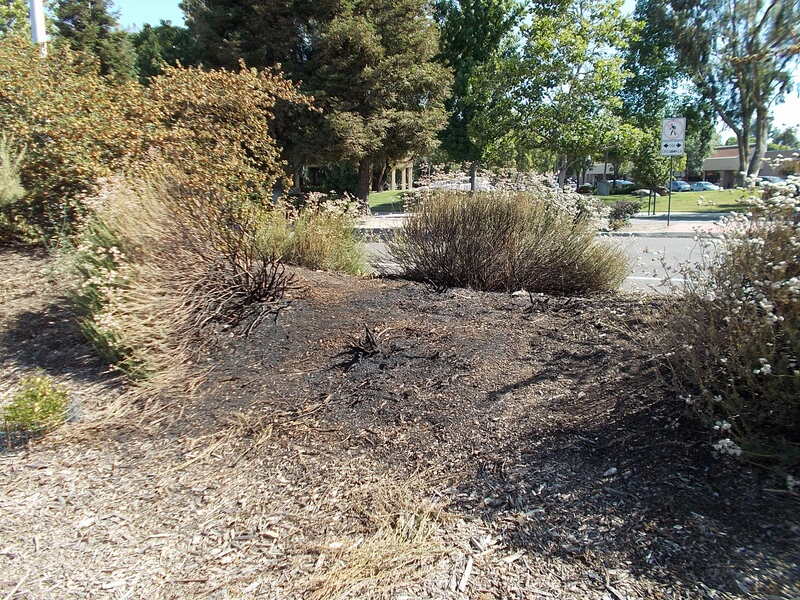 Hopefully the fire will initiate a change in our relationship to the natural areas that are part of the Livermore environment, a change in thinking and management that encourages the constant removal of non-native weeds along the arroyo and the re-establishment of native species. When You’ve Got Lemons, … … make lemonade. 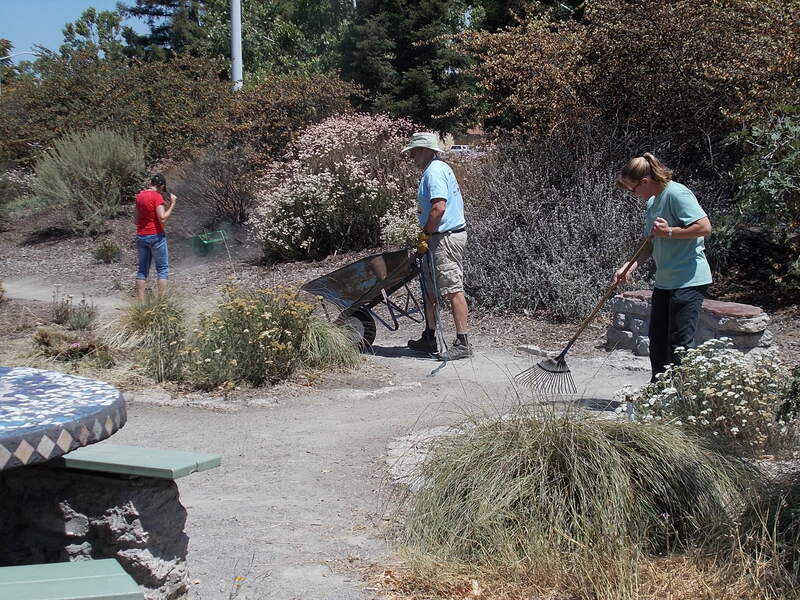 The staff at the Granada Native Garden have already begun to clean up the burned parts of the Garden. While the fire is something we could have done without, a number of optimistic people have pointed out what can be learned from this tragedy. 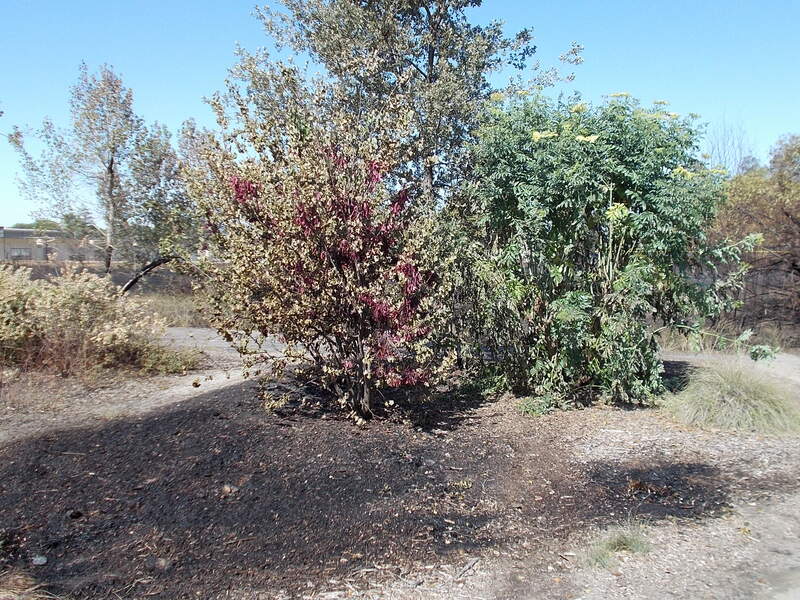 For one, it’s an opportunity to learn and observe how the native plants react to fire damage. While we expect some plants to regenerate by themselves in the winter and spring, we will see which ones survive the best. 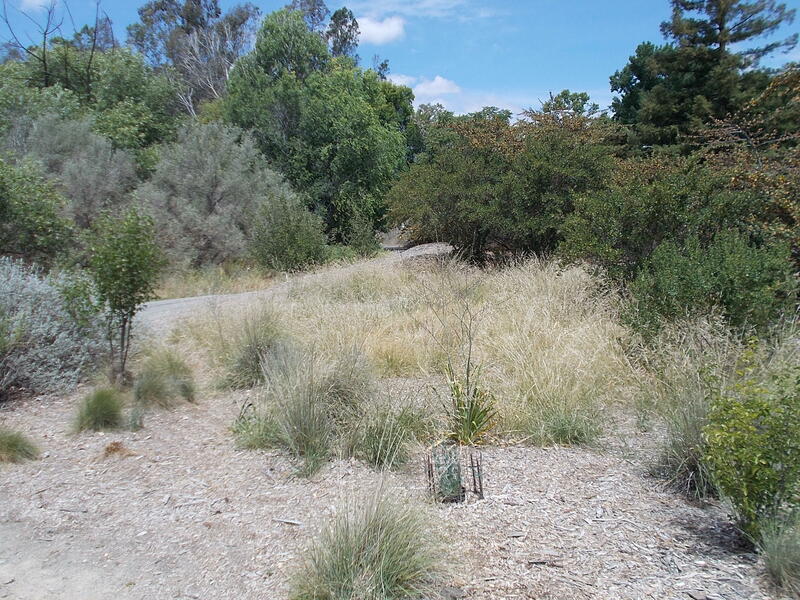 Further, this information will be of interest to Cindy, who has started her own landscape design company, when she is asked by her clients how native plants with their low water needs might increase the fire hazard in the vicinity of their homes. We know that the seeds of some plants need fire in order to germinate. One of those is the bush poppy (Dendromecon rigida and Dendromecon harfordii). 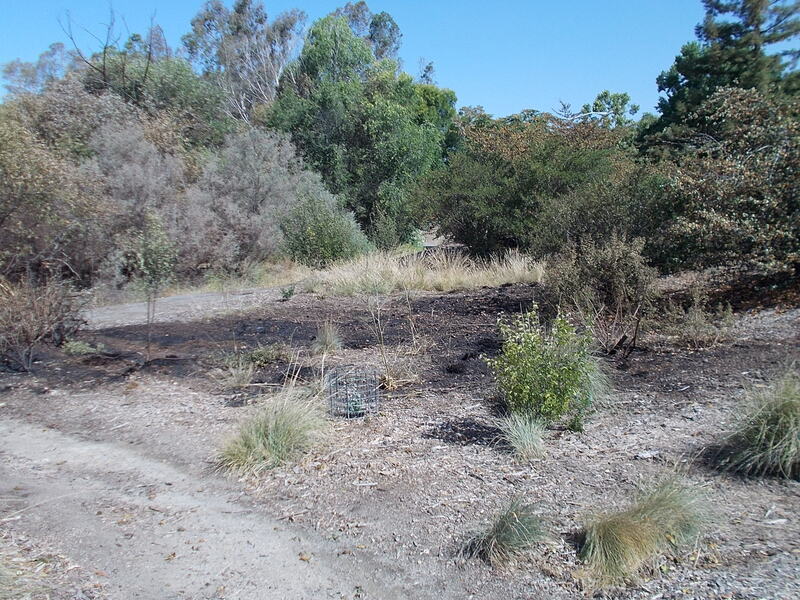 The single bush poppy at the GNG was briefly touched by fire, and we will be watching for seedlings sprouting up in that area. Nutrients released by the fire and washed into the ground by winter rains should help these little fellows along! 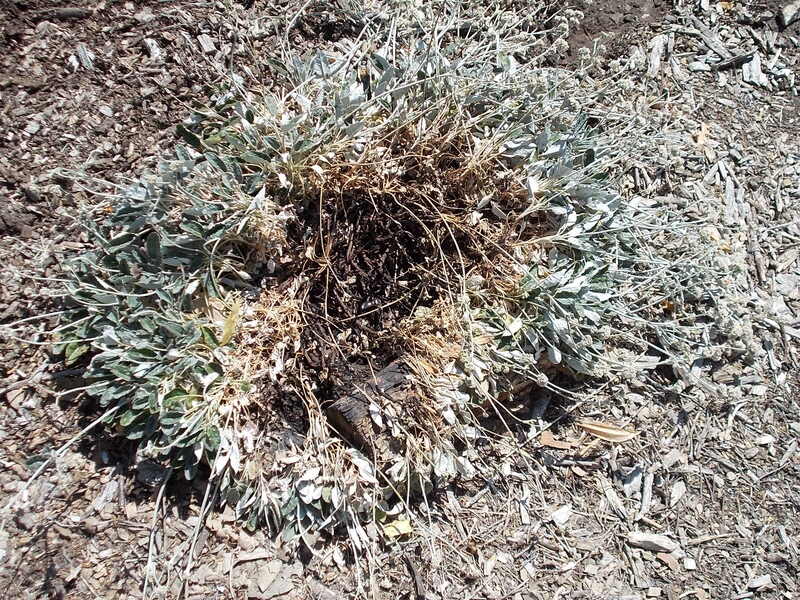 Finally, while many of the plants were toasted above ground, they will readily re-sprout and spread from underground rhizomes (even to the point of being considered invasive). The currants (genus Ribes) and roses (genus Rosa) are especially good at this. So the fire can be a learning opportunity. Maybe that’s why Dave can manage a big smile on his face!